The Delta system4 Synthesis allows verification of the dose delivered to the anatomical structure of the patient own combining two systems dosimetry: Delta4 Phantom + Delta4 Discover, both systems wirelessly for convenience of use. The combination of these two systems in Synthesis Delta4 software provides the latest and most advanced dosimetric wireless technology without additional workload. 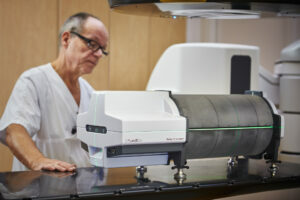 A Delta features4 Discover “Express Measure”, Delta4 Synthesis provides complete flexibility in controlling quality of treatment to work with any workflow. further, 4D provides patient dose DVH including analysis of the administered dose vs. planned dose. Without build-up. Unlike other solutions on the market, Delta4 Synthesis pre-treatment uses dummy to calibrate the system for pre-treatment verification. This makes the attenuation is less than 1% It is the lowest attenuation market. actual measurements. 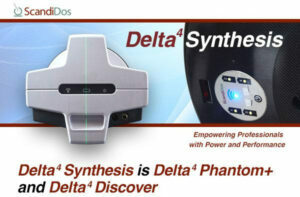 Unlike other systems, Delta4 Synthesis is based on 3D measurements with dummy Phantom + providing greater safety and precision in complex treatments or implementation of new techniques. No extrapolations. Delta4 Synthesis, Neram technology, You need not extrapolate creep measurements from the detector fixed on the gantry and thanks to Phantom +, measures where it really matters and the measures taken are empirical measures. same software. Management ScandiDos all applications use the same software already known so the learning process is extremely efficient.